"We're not just sending dresses, we're sending hope." Join a casual group of sewers Tuesday nights, 4:30 PM - 6:30 PM, at the East End Arts School to create dresses together and share material! Or sew at home and drop them off at the East End Arts School. Visit Riverhead Vacuum and Sewing Center, located at 31 E Main Street in Riverhead, NY - they are offering 10% off your sewing notions (elastic & seam tape) for this project. 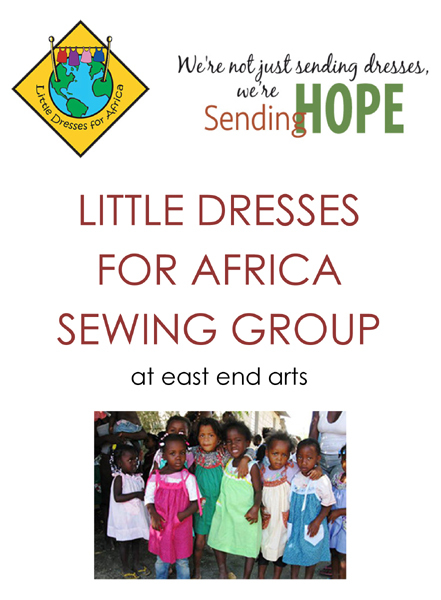 Mention East End Arts Little Dresses for Africa Sewing Group coordinated by Diane Giardi to receive this discount. Contact East End Arts Education Director, Diane Giardi at 631-369-2171 or dgiardi@eastendarts.org if you would like to learn more.